KL Visual Risk Manager Pro – the tool for traders for whom capital preservation is a top priority. Let me present my new revolutionary method of sending orders according to what you see on a chart, which is in full accordance with Risk Management. 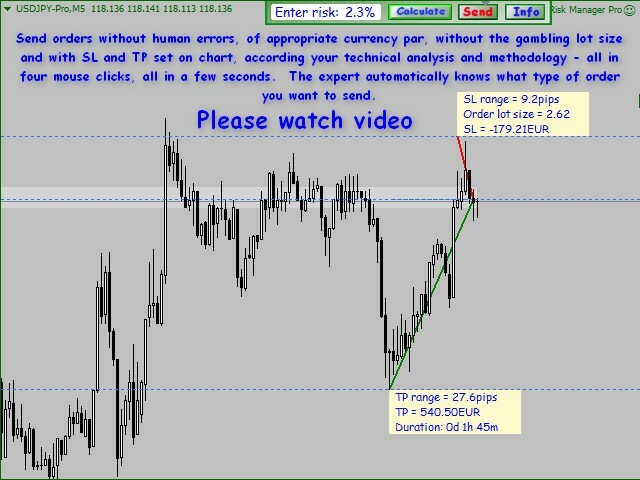 Sending orders without human errors, using an appropriate currency pair, without gambling a lot size and with SL and TP set on chart according your technical analysis and methodology - all these are made in four mouse clicks and in a matter of seconds. The expert automatically knows what type of order you want to send. All six kinds of orders – market and pending - are supported. Are you confused by big expert advisor panels occupying almost half size of the chart? KL VRM Pro has small but powerful auto-hiding panel, with only two buttons needed for calculating and sending orders. One button is enabling draw/calculate mode. 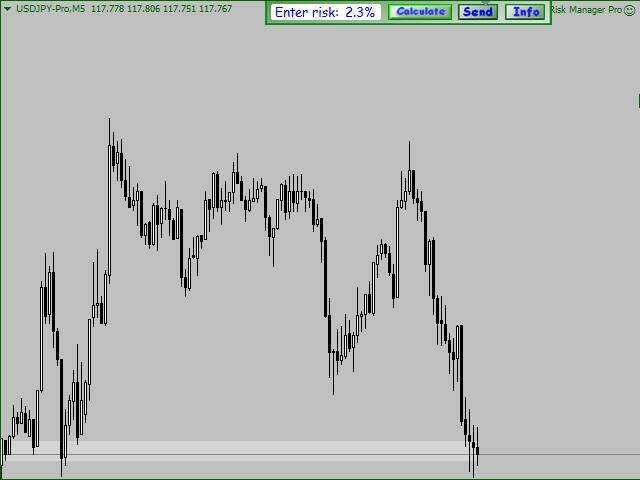 You draw on your chart by clicking and choosing destination entry, SL and TP, e.g. adjusted to candlestick patterns, SR, SD zones, Fibo levels and so on. When you are clicking drawn line of SL or TP is following mouse pointer. After three mouse clicks your order is calculated, and you can read all values from dropped labels at SL and TP. Now you can send calculated order by clicking button Send, and also take a screenshot of calculation or perform another calculation by pressing button delete on your keyboard. When you end calculations press button Calculate again, then expert panel will auto-hide and the chart will be cleared from calculations. The chart is also cleared when you press button Delete. Please watch video before you read the whole description, because description of this visual tool is of the category "how to use a hammer" – easier to understand what you see. Stop loss label will show you SL distance in pips, the lot size of order calculated according to SL distance and set risk, and value of SL in currency of account. The pip distance for TP is calculated from entry point, potential TP value in account currency, and time duration of the trade that can help to determine roughly an approximate future duration of the trade based on past movements (swings). 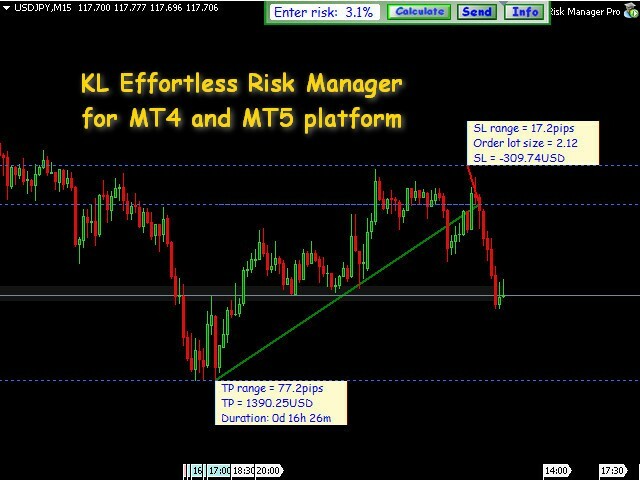 KL Visual Risk Manager Pro prevents you against risky trading. KL VRM Pro accelerates and facilitates managing of orders, in this way increasing trading productivity! You will place orders with the appropriate lot size, SL, and TP calculated according to what you see on the chart. Risk Management forms 0.1% of Account Balance. The lot size of the order is calculating according to broker permitted minimum, maximum and lot step. Duration of previous swings can help to determine roughly approximate future duration of the trade (similar like SR levels help to determine price movements). Auto-hiding panel with buttons Calculate, Send, and Info. Button Calculate – enable/disable drawing and calculation mode. Calculations are made automatically when you draw by clicking destination entry, SL and TP. Button Send – sends the calculated order according to its type. Button is inactive before targets are drawn. Button is changing color: it has red description if the order is sent as market. To find out the news and updates of all my products visit my profile https://www.mql5.com/en/users/Klore. If you have any questions or suggestions, feel free to let me know. If you like my products please leave feedback. Get from 25 up to 30% pay off from sales of my products! Спасибо автору! Давно искал,не заменимая вещь в работе! Thank you author! Long ago searched for this program, necessary thing in trade! Unfortunately, in previous file, inputs disappeared due to changes in MQL language. Now you can change settings. Fixed bug with sell stop order. Update for Dmitry Boltenkov - support for RTS-6.15 and RTS-9.15 where order price must be rounded to 10 RUR. Added choice of order expiration, true = 24h, false = does not expire.